Fits Bosch models that begin with UM3, MUM6, and MUM6N. This attachment juices oranges, lemons, grapefruit and limes wonderfully. 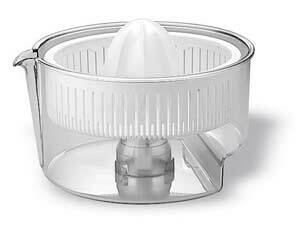 The strainer basket has a removable ring for easy cleaning. The pouring spout allows easy pouring without spills. We have done boxes of fruit at a time with great success.